Have you ever wondered who is at your door when the doorbell rings? Should I answer or is it just a door-to-door solicitor? Jim and Marla Diner will no longer have to wonder that as they were the lucky grand prize winners of our recent Customer C.A.R.E. Day raffle. 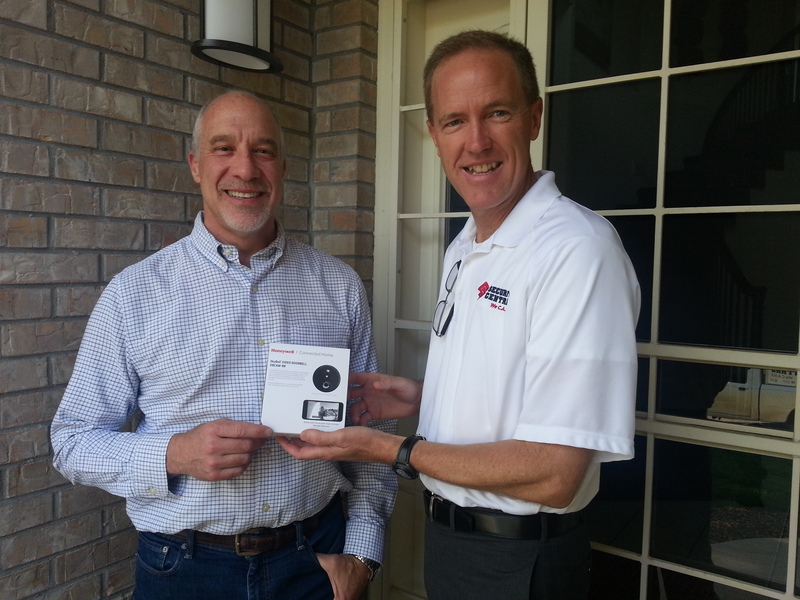 They won the Honeywell Skybell video doorbell system. Jordan Jackson, president of Security Central, presented the grand prize to Jim and Marla at their home. Security Central technician-extraordinaire Harry Levin installed the video doorbell and activated it on the Diners’ smart phones so they can now see, hear, and speak to anyone at their front door from their phones anywhere in the world. 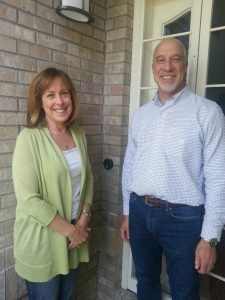 Jim and Marla are quite tech-savvy and security-conscious, so they loved seeing the high-definition view of their front porch pop up on their phones as we rang their new doorbell. When we explained that the video doorbell also has a built-in motion detector that can provide early warning when someone approaches their porch, Marla jokingly replied, “Oh, we already have an early warning system… our dog!” At least now they will be able to quickly see what their dog is barking at! Jordan Jackson also pointed out to Marla light-heartedly that the Skybell can also be considered a home decorator item as well since the color of the LED’s that illuminate the doorbell is selectable through the app. Therefore, Marla can modify the doorbell color to be a seasonal decoration such as red for Valentine’s Day, orange for Halloween, green for Christmas, etc. It’s a silly little feature, but some homeowners love it! We also had two runner-up winners in our raffle. Congratulations to Jim Johansen of Insurance Unlimited and Ruth Oborny; they both won three months of free monitoring service. Be sure to sign up for our raffle next year at our Customer C.A.R.E. Day on May 12, 2018. You may be our next lucky winner!